In 2013, the European Space Agency adopted "The Gravitational Universe" as the science theme for L3, the agency's third large-class mission. On 20 June 2017, the ESA Science Programme Committee selected the Laser Interferometer Space Antenna (LISA) concept as the next step in the search for gravitational waves travelling through space. Gravitation is the weakest of all the forces of Nature, but we are all dependent upon gravity. Without it, we would not have any weight – rather like astronauts orbiting Earth. Anything that is not rooted or tied down would fly off into space. Despite centuries of study by scientific luminaries, such as Galileo Galilei, Isaac Newton, and Albert Einstein, many questions remain about the origin and nature of gravity. One of the predictions of Einstein's general theory of relativity was that periodic disturbances of spacetime – gravitational waves – are created by a massive object that is accelerated, oscillating, or violently disturbed. Potential sources include rapidly spinning bodies that are distorted from a perfect sphere, close binary systems that include massive neutron stars or black holes, and exploding stars known as supernovas. It might also be possible to detect faint ripples created during mergers of entire galaxies or generated shortly after the Big Bang, nearly 14 billion years ago. These waves radiate outward, travelling across space at the speed of light. Whilst doing so, they modify the shape of any solid bodies that they encounter, stretching and squeezing them. They also produce infinitesimal variations in the distance between independent masses that are on their path. As an example, the variation of the distance between Earth and the Moon caused by a passing gravitational wave would be less than the diameter of an atom. Gravitational waves are extremely difficult to detect, since they hardly interact with matter, and their presence, intensity and source can only be derived from the effects that they have on bodies around them. The sound of two black holes colliding. The first detection of the elusive gravitational waves was achieved on 4 September 2015 by the twin Laser Interferometer Gravitational-Wave Observatory (LIGO) facilities in the United States. The LIGO scientists believe that the tiny ripples in spacetime were generated 1.3 billion light years away, when two massive black holes spiralled into each other and coalesced into a single, even more massive, spinning black hole. Since then, gravitational waves have been detected by LIGO on two more occasions, and by the LIGO-VIRGO three-laser interferometer combination on another occassion. It is clear that gravitational-wave astronomy has become a reality. With sensitive ground-based observatories such as LIGO, why do we need to develop a space observatory? Just as it is essential to observe a planet, star or galaxy in many different wavelengths of light – for example, visible, infrared, ultraviolet – to fully understand its nature, so it is necessary to search for and study gravitational waves at many different wavelengths. Systems with very large masses, such as black hole binary systems at the centres of merging galaxies, produce gravitational waves at low frequencies. While ground observatories are very sensitive to high frequencies, they are inherently limited by natural and human-generated seismic noise. Only an advanced space observatory is capable of detecting gravitational waves with very low frequencies – too low to be observed above the random seismic noise, the vibrations, of the Earth. The answer is to go into space, away from such disturbances. Around the turn of this century, scientists from Europe and the USA began to consider development of the Laser Interferometer Space Antenna (LISA), envisaged as a joint ESA–NASA mission to observe astrophysical and cosmological sources of low frequency gravitational waves. LISA would consist of three identical spacecraft flying 5 million kilometres apart in an equilateral triangle formation. This huge separation, much longer than is possible between any pair of detectors on Earth, would make LISA sensitive to lower frequency gravitational waves in the range 0.1 mHz to 1Hz. As gravitational waves from distant sources reached LISA, they would warp spacetime, altering the distances between the three spacecraft. By using lasers to precisely monitor the separation between the spacecraft, it would be possible to detect and measure these variations. By studying the shape and timing of the waves, scientists would learn about their nature and origin. A scaled-down design, known as the New Gravitational-Wave Observatory, was proposed as one of three candidate L-class missions for ESA's Cosmic Vision science programme, but despite being unanimously ranked first in terms of scientific interest and strategic value for science, ESA decided in 2012 to opt for the JUICE mission to Jupiter as its next large space science mission. One consideration that the selection committee had to take into account was the readiness of the advanced technologies that would be required for LISA. Each spacecraft was to carry free-floating test masses within the spacecraft in order to be protected from various disturbances in space. The spacecraft were to be connected by laser beams that would measure the separation distances of these test masses with extremely high accuracy. Each spacecraft would send a beam of laser light to the other two spacecraft, and in turn receive a beam from them. The precision of the laser separation measurement required was 1,000 times more demanding than had ever been achieved in space before. The intention was to measure changes in separation caused by passing gravity waves with a precision of about 10 picometres (one hundred thousandth of a millionth of a metre) over a distance of five million kilometres! The spacecraft would also carry a new type of electric propulsion to ensure ultra-accurate station-keeping for the three spacecraft. In order to prepare for LISA, ESA and NASA decided to flight-test most of the critical technologies on the LISA Pathfinder technology demonstration mission. LISA Pathfinder operating in space. Development of LISA Pathfinder began in 2004 and the spacecraft was completed over the next decade by European and US specialists. In order to test in orbit the concept of low-frequency gravitational wave measurement, the single spacecraft carried two test packages. The LISA Technology Package represented one 'arm' of the LISA interferometer, in which the separation of two test masses was reduced from 5 million km to 35 cm. The identical test masses comprised 46 mm gold-platinum cubes, each floating in its own vacuum container. The test masses fulfilled a double role, acting both as mirrors for the laser interferometer and as inertial references for the drag-free control system. The second package was the Disturbance Reduction System, a NASA-supplied system that included two clusters of micro-propulsion thrusters and an electronic unit containing a computer with associated drag-free control software. The mission began with a launch on 3 December 2015. Over the next seven weeks, the spacecraft made its way to the L1 Lagrange Point, about 1.5 million km from Earth in the direction of the Sun. Scientific operations began in March 2016 and by June LISA Pathfinder had successfully demonstrated some of the advanced technologies required for a gravitational wave observatory in space. The results far exceeded expectations. 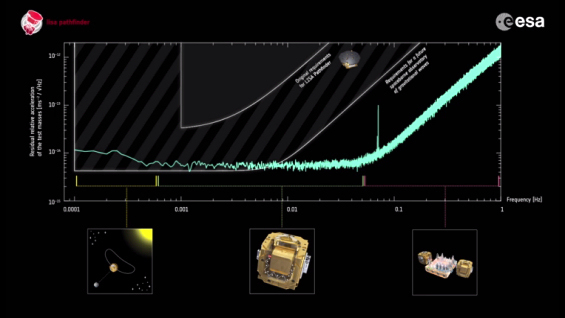 LISA Pathfinder performance (click here to access the video and more details). In November 2013, ESA's Science Programme Committee decided that the L3 mission will address the theme 'The Gravitational Universe'. The key concepts to be addressed by the L3 mission include: the nature of gravity, the nature of black holes and black holes as sources of energy, dynamics of galactic nuclei, formation and evolution of stellar binary systems, the very young Universe, and cosmological issues such as the cosmic distance scale. In late 2014, ESA's Director of Science and Robotic Exploration appointed an external committee, the Gravitational Observatory Advisory Team (GOAT), to advise on the scientific and technical implementation of L3. The committee's task was to determine whether such an observatory is technically feasible, whether laser interferometry is still the best approach to the measurement of gravitational waves from space, and how the technical development of L3 can be organised to minimise cost and schedule overruns. The GOAT report stated categorically that a space-borne gravitational wave observatory is possible and that laser interferometry between free-falling test masses is the detection method of choice. The successes of LIGO and LISA Pathfinder show that such systems are in an advanced state of technical readiness. On 25 October 2016, ESA issued a formal call for proposals from the scientific community. The proposal for 'LISA-2' was evaluated, and on 20 June the LISA concept was selected as ESA's next large mission, L3. Formal adoption of the mission by ESA's Science Programme Committee is expected no later than 2025, with a launch nominally scheduled for 2034. The success of LISA Pathfinder will be crucial to developing this mission, but much additional technology will be needed to extend the single-satellite design to multiple satellites. For example, lasers much more powerful than those used on LISA Pathfinder, as well as highly stable telescopes, will be necessary to link the freely falling masses over millions of kilometres. ESA's L-class missions are selected under the agency's long-term Cosmic Vision 2015–2025 space science programme. JUICE (JUpiter ICy moon Explorer) – a Jupiter orbiter that will make detailed observations of the largest planet in our Solar System and three of its planet-sized moons, Ganymede, Callisto, and Europa.Universe'. ATHENA (Advanced Telescope for High-ENergy Astrophysics) – an X-ray telescope designed to address the Cosmic Vision science theme 'The Hot and Energetic.